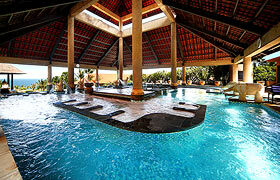 Bali Spa Thermes Marins is in the worldwide famous Ayana Resort & Spa. They put traditional Indonesian health & beauty treatment together into scientific Thalasso therapy and produce a new total spa, thereby wins many global prizes. The interior of Thermes Marins is based on interior of "purple" said to bring healing and beauty in highest service quality. Immerse yourself in the healing power of sea minerals with this oceanic ritual. Your body is wrapped by seaweed containing a high concentration of trace elements as you lie on a water-heated table to enhance mineral absorption. The masque is removed with warmed seawater from a Circulatory Shower. While a warmed seawater Affusion relaxes and tones your muscles, your therapist massage your body with her forearms using the Hawaiian lomi-lomi technique and stress-relieving herbal balm. The treatment concludes with Dynamic Affusion to help not only nourish and cleanse your skin but leave you feeling reborn. This impossibly romantic experience is so luxurious and rejuvenating that it will surely deepen your love even further! Start with a soothing foot wash to revive tired feet and prepare you for a full body scrub to remove dead skin and resotre youthful shine. This is followed by Flower Bath and body massage, leaveng you calm and peaceful before the final part of your treatment, a facial to restore suppleness to your skin and leave you feeling completely refreshed. 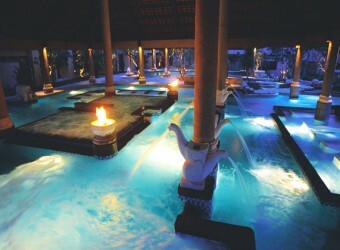 Feel the harmony of French thalassotherapy combined with traditional Balinese remedies. A session in the Aquatonic pool targets your whole body via therapeutic jet streams, micro-bubbles and geysers, before body scrub to remove dead skin cells and restore yourthful skin shine. 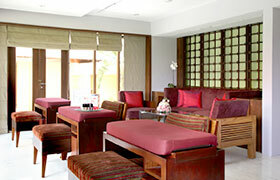 You will literally tingle with the increased circulation and energy, while you enjoy a balanced meal at the Spa Cafe. Detox, increasing blood circulation, and create healthy skin. Apply Body Wrap by pasted seaweed to affect to body system and enhance detoxifying naturally. Cover body by warm blanket over the body wrap in order to get good result of the treatment. Meanwhile, enjoy face and head skin massage. At last, massage with essential oil, sweet almond, rosemary peppermint, and Western cypress blending. Slimming body line while smooth spots that has cellulite. For the first 40 min, massage using Thermes Marins’s original oil blending of sweet almond, rosemary peppermint, and Western cypress and apply spots for reducing fat. After apply Body Wrap by pasted seaweed and cover body by warm blanket over the body wrap in order to increase blood circulation. At the end, apply gel to make shape body line and more reduce fat. You can have confidence of your body line. 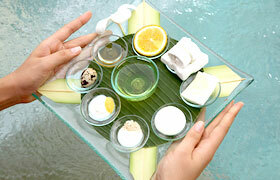 Traditional Javanese treatment to seek beauty and relaxing. Use turmeric and herb paste pack to finish-up beautiful skin, and after removing lulur by yogurt, relax in Flower Bath. Then, apply Traditional Balinese Massage to increase blood circulation. Warm muscle by spice body mask, and reduce pain on joints. After the treatment, relax in Flower Bath. 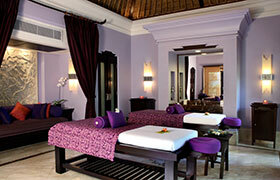 For finishing, apply Traditional Balinese Massage to increase blood circulation. Your experience begins with a Foot Wash using natural sea sand, as though you have been strolling along the beach. Invoking Bali's warm tropical sea breezes, the treatment continues with a Sand & Shell body scrub and dip in our refreshing Sea Crystal Mineral Bath followed by a soothing Body massage. Complete your marine healing with a detoxifying Green Sea Mud Body Wrap. Use Thalassotherapy’s original seawater shower and apply herb balm massage while taking warm seawater shower. It has effect of recovering tiredness, relaxing, and revitalizing skin. Massage with aromatherapy herbal balm to calm your spirit, using a combination of Balinese long strokes and Hawaiian lomi-lomi technique to eliminate stress and increase lymphatic drainage. Long lasting Balinese traditional hand pressure massage. Massage and remove whole body stiffness. An ancient Egyptian, Chinese and Indian therapy focusing on reflex points in the feet to improve blood circulation and ensure long, healthy life. This fresh and natural approach combines Swedish and Deep Tissue massage strokes with a beautifully crafted set of warmed aroma oil-soaked Bamboo tools to roll, slide, knead and tap you into a deep state of relaxation. Customize your massage deep and penetrating or smooth as silk. This is combination with traditional Ayurveda and aroma therapy, stone therapy,chakra sound healing treatment. It will be relax your body and mind to cleanup your soul. This massage is using warmed shell for massage muscle. It will control your energy balance also chell facial massage for refresh. This is use a volcano stone to refrexology treatment which the technic from China , Thai, Europe. They start at foot bath and foot reflexology to whole body. It is deep relax treatment to recharge for your body and mind. This is use herb bag to massage your body. The maasage is type of strech and acupoit massage also special brend herb will heal you. Especially good effect for loosen and wrinkle skin, and create soft and tones skin. Tones and firms the skin, restructures the skin's connective tissue, promotes blood and lymph circulation and stimulates the body's normal process for eliminating excess fat. The aquatonic pool at our Bali thalasso spa contains 700 million liters of water from the Indian Ocean, warmed to optimum temperatures to rebalance mineral deficiencies and to provide your body with the curative and preventative properties of seawater. Thanks to its floating effects, you are able to effortlessly exercise your way through 12 hydromassage stations using the pool's therapeutic jet streams, micro-bubbles and geysers to rehabilitate injured muscles, to relieve stress and for relaxation. *Aquatonic pool is designed for therapeutic exercise and is not appropriate for children unless they are over 17 and are using the pool for treatment sessions. Aqua aerobic exercises to improve flexibility. Instructor supports you. * If you also wish to use Aquatonic pool, please reserve during 12:00-18:30. Relaxing massage composed by moving, stretching and localized pressure to promote muscular stretching, deep relaxation and sensory disconnection. *If you also wish to use Aquatonic pool, please reserve during 12:00-18:30. Massage, Face mask with fresh vegertable, fruit and yogurt that make you blight skin. Marine Collagen with protective anti-pollutant properties helps regenerate, improve moisturizing, and restore skin elasticity and radiant. Detox facila cleansing make your skin more blight and healthy. Guests from Nusa Dua, Jimbaran & Kuta booking treatments valued at IDR2,500, 000 or more are entitled to complimentary, round-trip transfer. I love Balinese massage very much, and every time I come to Bali I take treatment at a spa. I had full body Balinese massage and it made me feel really good! It was a 90 minute massage but I felt like it passed very quickly. I was satisfied by a friendly therapist and her great massage technique!